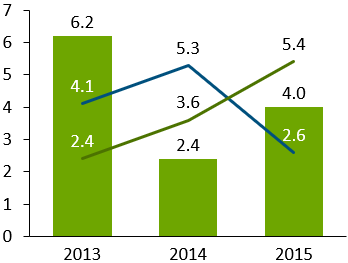 In think-cell, we do not distinguish between simple column charts and stacked column charts. If you want to create a simple column chart, enter only one series (row) of data in the datasheet. For a quick tour of the column chart, refer to the example in the chapter Introduction to charting. Bar charts in think-cell are simply rotated column charts, and can be used exactly as column charts. In addition, you can create butterfly charts by placing two bar charts “back-to-back”. To do so, apply the functions rotation (see Rotating and flipping elements) and same scale (see Same scale). Then remove the category labels for one of the charts. For the steps to create a stacked clustered chart, see Clustered chart. 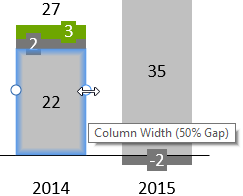 To change the column width, select a segment and drag one of the handles at half the height of the column. The tooltip shows the resulting gap width while dragging. 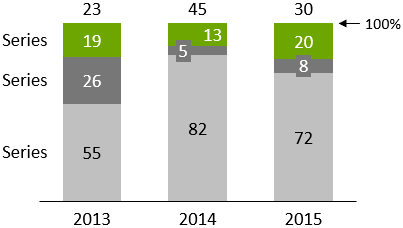 A larger column width results in a smaller gap width and vice versa, as the chart width is not altered when column widths are changed. The gap width is displayed as a percentage of the column width, i.e., a value of 50% means that each gap is half as wide as a column. Changing the column width for one column will change it for all other columns as well. All columns always have the same width. 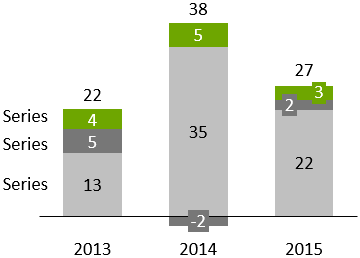 For a chart with variable column widths depending on your data, see Mekko chart. To make individual gaps wider, see Category gap. 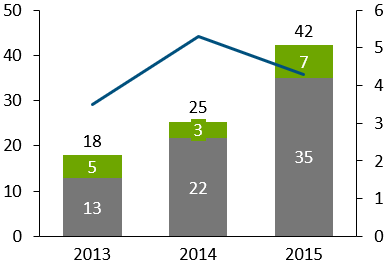 The clustered chart is a variant of the stacked column chart, with the segments arranged side-by-side. 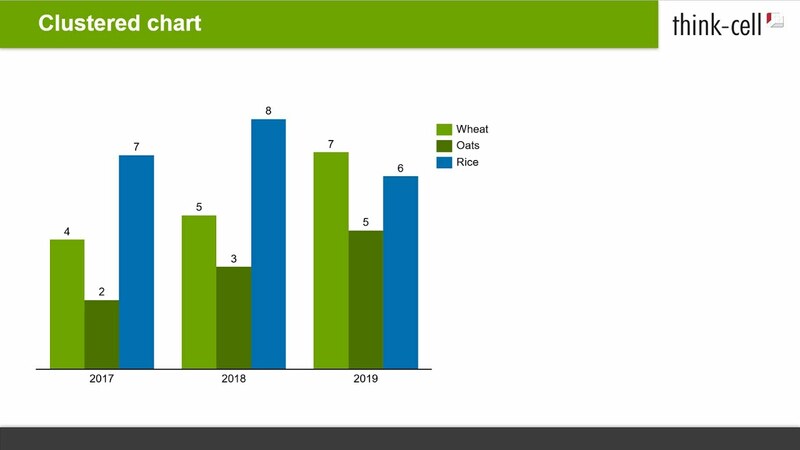 A clustered chart can be combined with a line chart by selecting a segment of a series and choosing Line from the chart type control of this series. If you want to arrange stacks of segments side by side, you can create a stacked clustered chart. Select a segment and drag the column width handle at half the height of the column until the tooltip shows 0% gap. 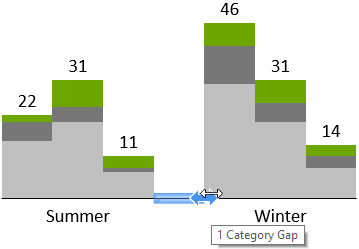 Click onto the baseline where you want to insert a category gap and drag the arrow to the right until the tooltip shows 1 Category Gap; this has to be repeated for all clusters. If there is an even number of stacks in a cluster, the label cannot be centered to the whole cluster. Use a PowerPoint text box as a label in this case. With think-cell, you can create 100% charts with columns that do not necessarily add up to 100%. If a column totals to more or less than 100%, it is rendered accordingly. For details about filling in the datasheet refer to Absolute and relative values. The line chart uses lines to connect data points belonging to the same series. 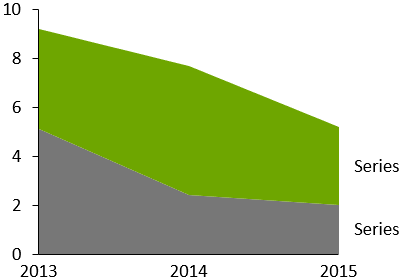 The appearance of the line chart is controlled by the line scheme, line style and marker shape controls in the floating toolbar. See Formatting and styling for details on these controls. Labels for the data points are not shown by default but may be displayed using the line chart Add Point Label context menu button. 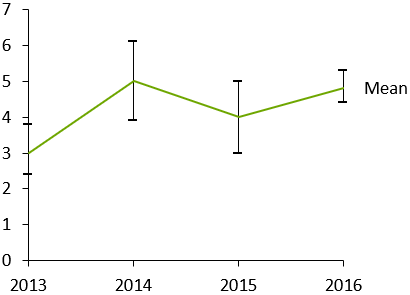 If the category values of a line chart are strictly increasing numbers or dates and can be interpreted as such according to the axis label number format, then the x-axis will automatically switch to a value axis (see Value axis). When dates are used the date format can be changed by multi-selecting all category labels (see Multi-selection) and typing a date format into the control (see Date format codes). If you want to show more labels than would fit next to each other horizontally you can use label rotation (see Label rotation). All category cells in the datasheet contain numbers and Excel’s cell format is also set to General or Number or all category cells in the datasheet contain dates and Excel’s cell format is also set to Date. The numbers or dates in the category cells are strictly increasing from left to right. The line chart can also display a second vertical value axis. Please refer to Secondary Axis for further information. The fill color of the cell containing the series name determines the line color. The fill color of each data point’s cell determines the marker color for this data point. If you prefer a smoother appearance of the lines in a line chart, you can turn on this setting. First right-click on the desired line, then use the Set to Smooth Line button. In line, area and area 100% charts, the Interpolate button can be used to display a chart with linear interpolation used for any missing data values in a series. 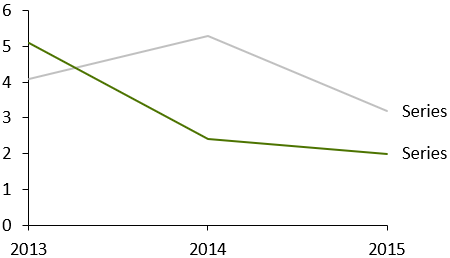 In line charts, interpolation can be enabled and disabled for individual series in a chart. In area charts, it can only be applied to the whole chart, because the series stack on each other. Error bars can be used to indicate deviations in the line and stacked chart. By means of the error bars the following chart can be created. Create a line chart with three series. The first series reflects the upper deviation, the second series reflects the mean and the third series reflects the lower deviation. Right-click the center line and choose Add Error Bars from the context menu. Remove the series labels for the upper and lower series. Select one of the error bars to change the marker shape and color for the upper and lower deviation and the line type of the bar for all error bars. You can also select an individual error bar marker to change the properties for this marker only. A handle appears at each end when you select an error bar. You can drag these handles to select which lines the error bars should span. You can also visualize intervals instead of the deviation around a central value if you set the error bar to only span two adjacent lines. An area chart can be thought of as a stacked line chart, with the data points representing the sum of the values in the categories rather than the individual values. 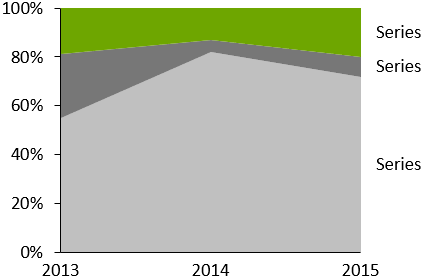 The appearance of area charts is set using the color scheme control. Labels for the data points are not shown by default but may be displayed using the area chart Add Point Label context menu button. The area chart Add Total context menu button can be used to display total labels. Linear interpolation can be enabled using the Interpolate button (see Interpolation). If Use Excel Fill on Top is selected (see Color scheme), the Excel fill color of a series label cell determines the fill color of this series’ area. The area 100% chart is a variant of the area chart with the sum of all the values in a category typically representing 100%. If the values in a category total more or less than 100%, then the chart will be rendered accordingly. See Absolute and relative values for more details about specifying data values. The labels of the area 100% chart can display absolute values, percentages, or both (Label content). Linear interpolation can be enabled using the Interpolate button (see Interpolation). A combination chart combines line and column segments in a single chart. Line chart and Column chart and stacked column chart describe in detail the usage of lines and column segments in charts. To convert a line to a series of segments, simply highlight the line and select Stacked Segments from the chart type control (see Chart type). To convert segments to a line, simply highlight a segment of the series and select the Line from the chart type control. The data sources of line charts, stacked charts and combination charts have the same format. 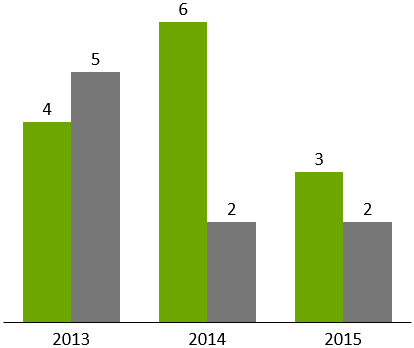 This function can be used in stacked and clustered column charts as well as in line charts.